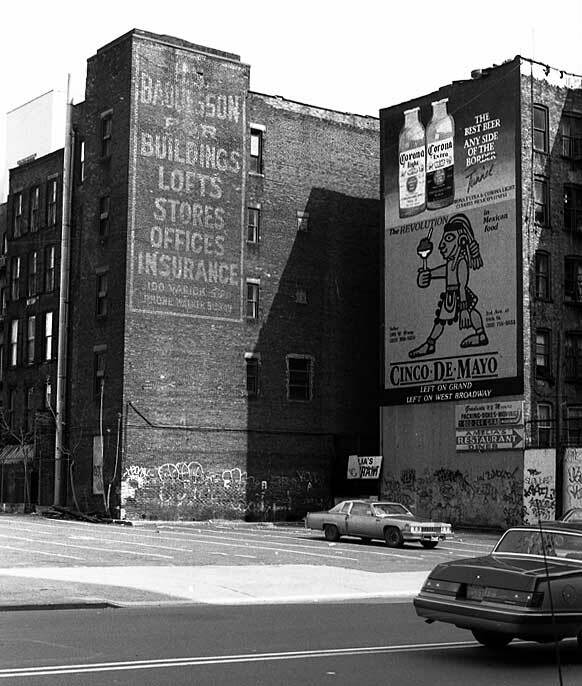 This sign at the back of a building on Broome St. looks across a parking lot to Varick St. Herbert S. Baudesson's real estate business was located at 100 Varick St., at the northeast corner of Watts St., a block south of Broome. Baudesson was located there from 1930 to 1933 with the telephone number WAlker 5-3349. The business moved in 1933 to 206 Varick St., then a year later to 620 Greenwich St., where they stayed until Baudesson's death in 1970. Herbert S. Baudesson (1892-1970) was 8 years old at the time of the 1900 U. S. Census, when he lived with his father, Otto Baudesson, an architect, on Beach Ave., the Bronx, N.Y. This is near Soundview Ave. in the Castle Hill area of the east Bronx. Baudesson is buried in St. Raymond's Cemetery in the same area. Herbert Baudesson registered for the World War I draft in 1917, when he said that he was born 12 Nov. 1892 in Berlin, Germany. In the 1920 U. S. Census Baudesson was recorded as immigrating to the U. S. in 1894. The Ellis Island website records 4 Baudessons arriving on the S. S. Dania from Hamburg 04-04-1894, including Herbert Sihules Baudesson, age 11 months. In 1942 when he registered for the World War II draft, Baudesson was "In business for myself, Real Estate, 620 Greenwich St., N. Y., Manhattan, N.Y." He lived at that time at 2316 Westchester Ave., the Bronx. A 1941 view of the corner of Greenwich St. and Leroy on the New York Public Library's Digital Collections shows a sign for H. S.. Baudesson at what was probably 620 Greenwich St. The family Schüler-Baudesson is mentioned in a short article at Familienverband der Familie v. Treskow. Baudesson may be related. His father's name is given as Schueler Baudesson in Trow's New York City Directory in 1897. The Deutsche Bauzeitung of 25 April 1877 mentions Udo Schüler-Baudesson. This is available as a google book.